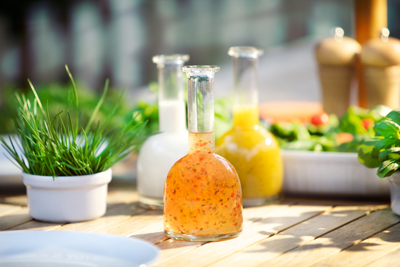 Dressings are pourable liquids used to distribute a herb mix or flavour over cold prepared dishes such as salads or meats. They are a popular way of delivering complex herb, spice and vegetable mixtures and garnishes in a simple form. They contain various types of acids for preservation and it is these combinations of fruit acids such as lemon juice and vinegars which define the product. Many dressings also contain oils from various sources which can also define the name. it is dressings, rather than mayonnaises, which employ the greatest variation in taste.